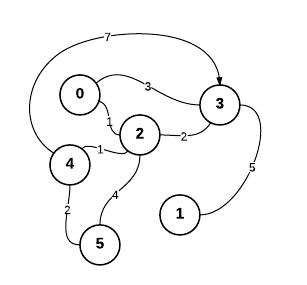 The Weighted graphs challenge demonstrated the use a Breadth-First-Search (BFS) to find the shortest path to a node by number of connections, but not by distance. When driving to a destination, you'll usually care about the actual distance between nodes. What algorithm will find the shortest total distance to each node? BFS makes sure to always reach the points in order of distance, so every node it reaches is along the shortest path. How can you make sure to do the same on a weighted graph? Think about an algorithm you could use before clicking below. Dijkstra's algorithm is an efficient algorithm for this purpose. It works in a similar manner to Breadth-first-search, but takes into account the weighted distance to each node. BFS adds the unvisited adjacent nodes to a Queue to explore so it can always visit each "level" in order of the distance from the original node. Dijkstra's algorithm tracks the total distance to each node and always visits the remaining node with the minimum total distance. This way, when it's done with a node, it knows it found the shortest path to that node. Instead of ignoring other visited nodes, it checks if the distance to them can be shortened. You can explore the algorithm in action below. You can view Dijkstra's algorithm in action here. Enter a 0 and click the button to run Dijkstra from node 0. See also Example Networks1 for a walk-through of the algorithm. Given a graph of input in the adjacency matrix format, can you find and print the distance from node 0 to all the nodes? Print out the shortest (weighted) distance from Node 0 to all the other nodes. Note that priority queue won't return highest priority item if it isn't updated as distances are updated.